Immediate former president, Goodluck Ebele Jonathan has tasked Nigerians on setting new standards for democracy in the country. According to him, Nigeria has to grow the credibility of its democracy to a stage where it would no longer wait for court judgment to conclude elections. GEJ, who made the observation at the 6th edition of African Ambassadors Interactive Forum, AAIF, and dinner, organised by African Third Sector Resource, ATSR, in Abuja, where he was presented with the “African Leadership & Achievement Award,” noted that by conceding defeat before the 2015 election result was declared, he wanted to set a new standard for the nation’s democracy and prove a point that election related litigation should no longer define Nigeria’s democracy. “I always say that I reformed the democratic process as President in order to consolidate democracy in Nigeria and the sub-region. I conceded defeat without a fight because I wanted to set a standard for our democracy, going forward. “My aim then was to change the narrative and prove that election related litigations should no longer define Nigeria’s democracy. People must not always go to court and obtain judgments before elections in Nigeria are declared complete. We don’t get to hear about such court cases in mature democracies. I wanted us to get to that point in our democratic experience. 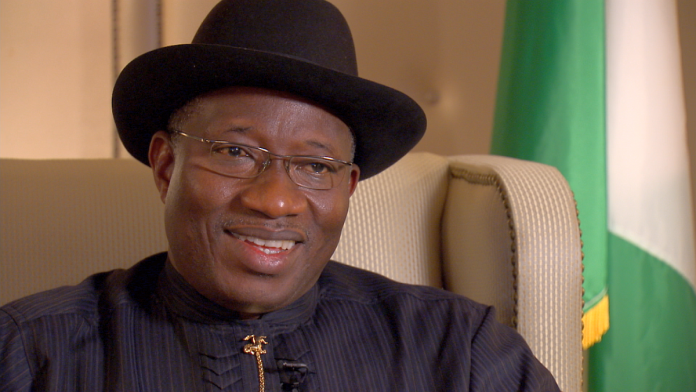 I thought that it won’t be out of place if we got to that stage where those who lost elections will be able to congratulate those who won.” Why I conceded defeat Jonathan said his commitment to the protection of lives and investments of Nigeria people, their assets and the economy made him concede defeat and avert looming crises. The former President, who was represented on the occasion by the former Minister of National Planning, Alhaji Abubakar Suleiman, recalled that already, some agencies in the United States had predicted disintegration, following growing tensions on the land at the time. He stressed that Nigeria and, indeed, Africa could have been doomed, if Nigeria was allowed to slide into anarchy. He said: “Above all, what that decision did for me and the nation was to avert a looming crisis. Given the tension in the land at that time, I was deeply contemplative of what would have happened if we had let our nation, the biggest black nation on earth, slide into anarchy, because of contestations for power. What then would have happened to our citizens, Nigeria’s economy and the investments driving its growth? “I was convinced that the implication for peace and the economy of the sub-region and the rest of the continent, couldn’t have spelled anything else but doom. Recall that after the 2011 Presidential election, which most observers adjudged transparent, with my victory generally seen to have been well deserved, crisis and conflicts still surfaced that claimed the lives of many of our compatriots, and property worth billions of naira destroyed. “I am always saddened each time I remember that among those who died needlessly then were 10 youths undergoing the compulsory one-year national service, who unfortunately got killed in a state where I secured only 16 percent of votes. Tension over disintegration “Before the 2015 elections, there was palpable tension in the land, to the extent that some international agencies, especially in the United States, were predicting the disintegration of the country in the election year. “As the President, I always had at the back of my mind that it was my responsibility to protect the assets of Nigerians and non-Nigerians operating in our economy. These were committed investors who had trusted our government with their investments, to be able to provide jobs and improve the lives of our people. “The steps I took while in office and during and after the 2015 elections were meant to secure our country, consolidate our democracy and protect those investments. I thank God that I was able to do what I did despite the irresistible force of power, and the usual worries about the uncertain fate that might befall a leader upon leaving office, especially in Africa. Earlier, Executive Director of ATSR, Mr Chijioke James, said the organisation has facilitated the forum to celebrate the fact Nigeria was able the get the narrative right during 2015 elections.